November could be considered one of the most difficult months of the year. Sandwiched between Halloween and Christmas, this last month seemed to drag on for an eternity to this university student, and not only because of the impending deadlines of my first official assignments and examinations. I did, however, enjoy my free time playing a spot of Polo and going back home to see and compete the horses. My university seemed to really kick it up a notch during the last few weeks of the first semester, suddenly introducing a plethora of workshop reports, essays, and tutorial essays that I was unable to navigate as easily as I had perhaps anticipated. Although I fully expected a welcome academic challenge, working my way through the steadily growing pile of work was a bit daunting and I was glad to get it finished and take a break by participating in my first Polo competition; the University Challenge. 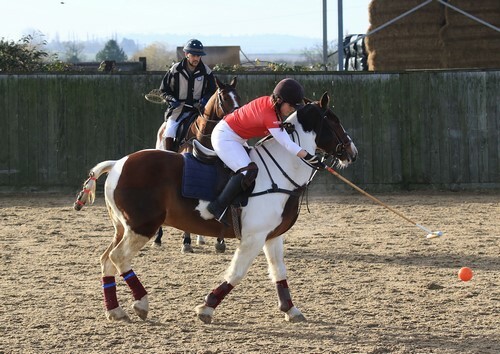 Having only played Polo a handful of times, I was under no illusion that my main aim wouldn’t just be to try and hit the ball and keep the pony between myself and the ground. I am pleased to say that I succeeded in both of my goals, but sadly the infinitely more experienced team we were up against were able to do a little bit more than that and beat us, although not by a wide margin. 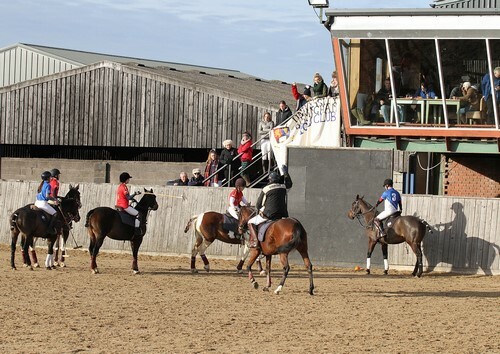 Due to my commitments at home, I was only able to ‘half seat’ and play two of the four seven-and-a-half minute chukkas, although it was still an enjoyable, if slightly competitive, experience. The highlight of the day for me was scoring my first ever penalty; given to us when one of our riders was slammed into by two opposing horses, one on each side, rather than the permitted one horse slamming into another. I am not a fan of using horses as an option for contact so I kept out of most of the brawls, but the ponies were highly unperturbed by the proceedings, although I have now decided that maybe our Arabians might just aim a nifty kick in the direction of an opposing pony and halt the play completely. In all honesty, I would have been quite embarrassed if I had missed the penalty as it was 15 yards away from an undefended goal. 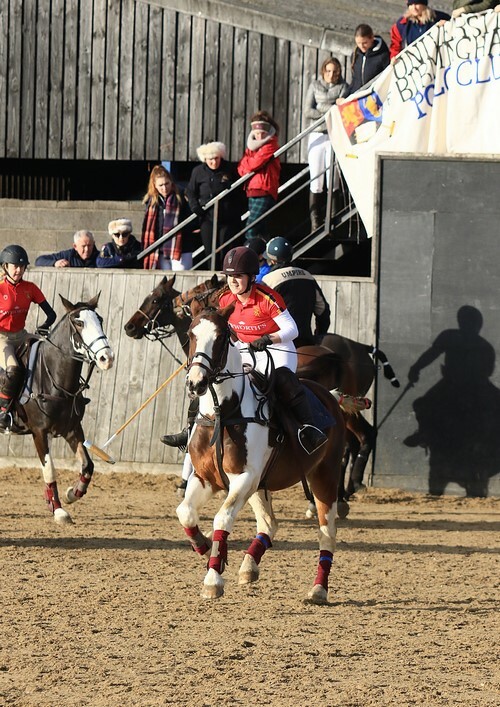 Still, it was brilliant to have the support of the UoB ‘Polo Seniors’ who were shouting advice and encouragement from the railings above the arena, and the cheering when the umpire raised his hand to signify a goal was quite a new and welcomed experience. Sadly, that weekend’s aforementioned commitment to home wasn’t the usual fun and games that the Avonbrook Arabians have so often provided. That Saturday, we weaned Mickey – Michelangelo d’Aurelius (Marcus Aurelius x Sabheeha Bint Krayaan) and said goodbye to his dam, Sabheeha, as we dropped her off back in her Herefordshire home. 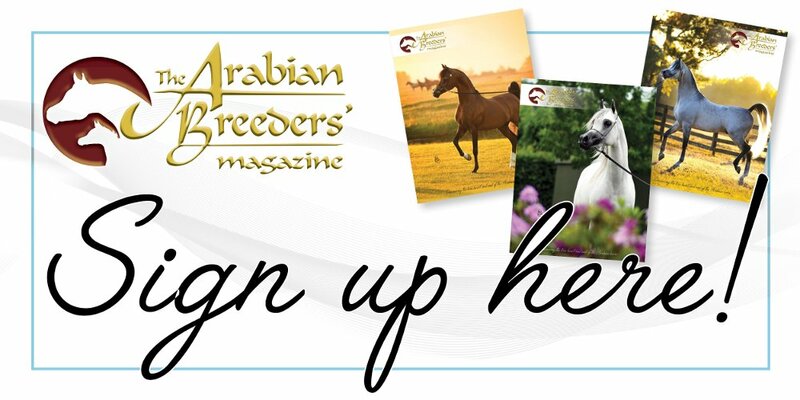 After initially being a quiet and unassuming house guest when she arrived last year, ‘Sabz’ quickly turned into the living embodiment of her outspoken and commanding Auntie Holly – Bint Zaehaebi (Autumn Royal x Richelle) who was mum’s foundation mare. Mickey is definitely one of the family, having inherited his father’s cheeky and charming personality, and his movement is a perfect mix of all of his Crabbet, Old English, and Bahraini lines. Mum and I are incredibly grateful to Gabby Franklin for letting us borrow Sabheeha; she was such a straightforward and easy mare throughout her time at Avonbrook Stud, and I look forward to seeing her hopefully come back into ridden work in the future. I was actually quite emotional to wave goodbye to Sabheeha when she dismissed us from her stable as she brought back some of the more favourable memories of Holly I had – when she considered me old enough to be of some use and not just a small grub with sticky fingers. Nevertheless, Sabheeha quite cheerfully ignored our departure and after a few days of looking rather lost, Mickey cheered up and is currently in the mare herd with the two ponies and the two Holly daughters; Penny – Annia Aurelia (by Marcus Aurelius) and Avonbrook Green Rose (by Vert Olive). Despite the emotion of weaning a foal and meeting university deadlines, I did eventually find the time to compete, on a rare weekend when my older sister Becky could take time off from her third-year university studies and come home to have a play on the ponies! In an almost unheard of turn of events, I found myself doing dressage as part of an ‘eventer challenge’ at our most local competition centre; Allens Hill. 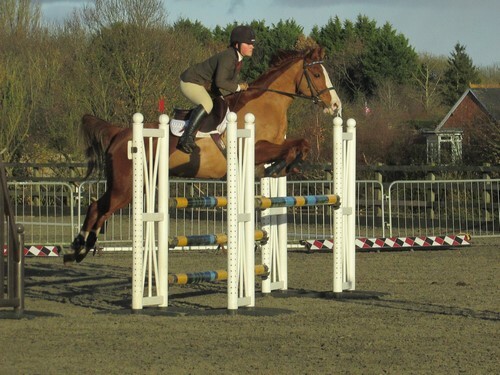 Poor Robbie – Avonbrook Silver Eagle (Marcus Aurelius x Caveland Calypso) – was first to go between the dressage boards in the BE90cm and performed a decent dressage test before surviving around the 16 fence showjumping and simulated cross-country course. 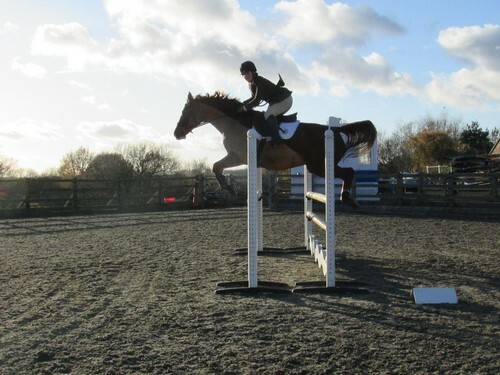 We belatedly realised that he had never seen a course of 90cm before, let alone two, so his attempt was actually quite impressive with only a couple of fences down and a ‘what is that!’ stop at a brush fence that, for a horse that usually idles about over little jumps with mum, was a good achievement. My second ride was in the 1.10 BE Novice class with my freshly clipped superhero Avonbrook Odin (Marcus Aurelius x April), who was feeling rather full of himself and very much enjoyed our first ever dressage test that included medium trot, canter, and some leg yielding. Odin was so confident in his abilities as a dressage horse, he started executing flying changes and demonstrating his impressive bucking abilities to the highly amused judges. Perhaps I shouldn’t have been laughing quite as hard as I was, although I wasn’t docked points for the occasional “Odin NO!”, as I probably encourage the naughty boy by not telling him off more firmly. 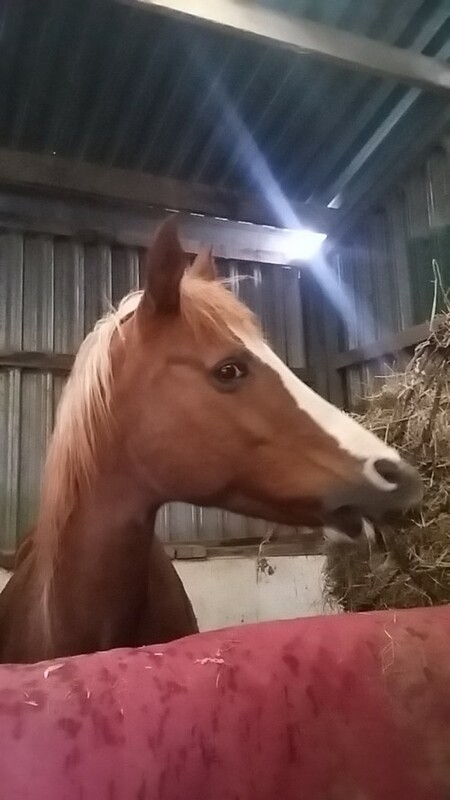 In my blog from July I detailed how his father Marcus was equally cheeky at the North Staffs Summer Show when he decided it was time to tell me exactly what he thought of my showing aspirations, and I feel Odin was communicating his preference for jumping somewhat during that test. 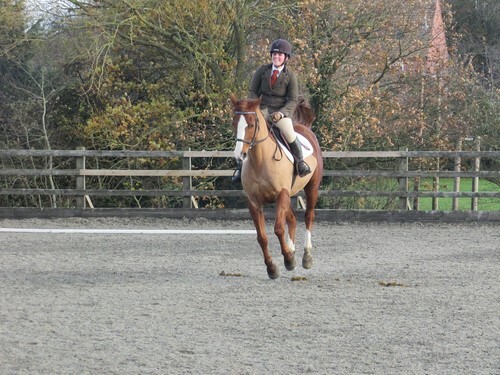 Not that he was much better behaved in the jumping, however. I was already a little nervous on what he may do as I had forgotten his bridle so he was careening around in Robbie’s martingale-less setup and he proved to me just how insignificant 1.10 is to him now by bucking a couple of strides in front of a few of the fences. 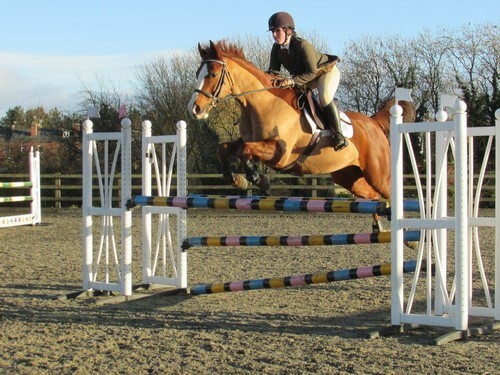 Embarrassingly for me, my trainer Erica was watching and probably wasn’t quite as amused with his antics as I was, so I feel the naughty boy may be going for a lesson before I bring him out showjumping at bigger heights where I need some sort of precision. In between all of the studying and competing, I managed to make time to jump on a train and go and see Becky and her friends down in Cardiff for the UK tour of Legally Blonde the Musical. Fitting with the lyrics of one of the show’s funniest songs, this month has been about keeping it positive when faced with adversity and doing so in a way that is both kind and true to oneself. During the short time I was there, we also went to Cardiff’s impressive Winter Wonderland and to see the new Thor film, all of which provided me with a break that I didn’t realise how much I needed until I was there. I think I have definitely found a spiritual home in Wales, despite still having a fierce loyalty to my own university in Birmingham because of the sheer kindness shown to me by my sister’s flatmates and friends when I inevitably hit the mental wall that accompanies starting a new chapter of life at university. I am, however, still very much afloat and ready to take on the next challenge that being a student who showjumps may bring.